Gain an extensive knowledge and understanding of the HSC Chemistry course topics with inspirational teachers. With increased clarity, you’ll feel more confident than ever. Learn to answer key verb questions such as ‘explain’, ‘compare’ and ‘assess’ effectively. Use our tools including flowcharts, tables and summaries to answer exam-style questions. Learn to write extended responses that get you the marks. Impress your exam marker with responses that are succinct, logical and sequential. Consolidate your understanding through multiple choice and short answer questions. General overview of historical HSC exam mark allocation data. Overview of historical HSC exam mark allocation data for Production of Materials. Refine your understanding through exam-style questions and past HSC questions from the Production of Materials topic, focusing on short and long response questions. Practice structuring long response questions to maximise marks. Overview of historical HSC exam mark allocation data for The Acidic Environment. Refine your understanding through exam-style questions and past HSC questions from the The Acidic Environment topic, focusing on short and long response questions. Overview of historical HSC exam mark allocation data for Chemical Monitoring and Management. Refine your understanding through exam-style questions and past HSC questions from the Chemical Monitoring and Management topic, focusing on short and long response questions. Vast HSC teaching experience with insights into exam techniques and an ability to explain concepts clearly. Intensive 3 hour lessons where you will cover the HSC syllabus thoroughly. A complete set of resources tailored for HSC exam success. 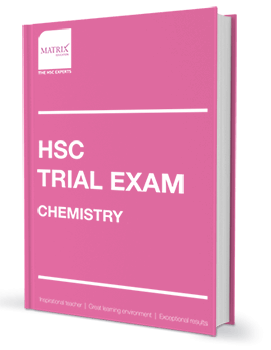 A Workbook that contains a variety of past HSC and HSC exam-style questions. Sample answers and flow charts for structuring extended responses. A friendly customer service team on standby to provide timely support. Be first to know when Trial Exam Prep Courses open. Leave us your email address to be notified when the course becomes available. Michelle is the Chemistry Coordinator at Matrix Education. She has over 10 years of HSC Chemistry teaching experience. She is also the co-author of the Matrix Chemistry program, course materials and assessments. Trusted by over 4,500 students from 220 schools. Get Trial Exam ready in just 6 days.